As the majority of toy production vendors are located in the Orient, communication between parent company--in this case, Kenner--and vendor is often difficult, complicated as it is by the large expanse of ocean separating the two. In particular, assembly and painting instructions can sometimes get garbled, either in the translation between languages, or through a simple misunderstanding. 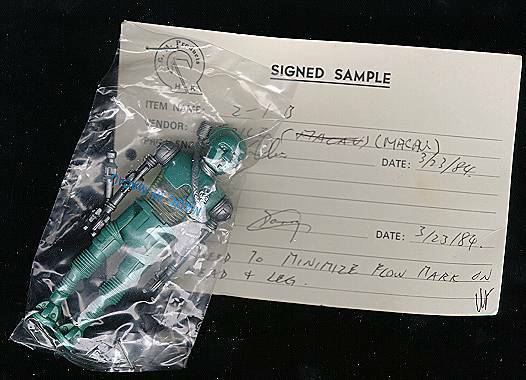 Signed sample product provides an interesting look into the vendor-Kenner relationship, and the back-and-forth process that is required to ensure that all product is up to snuff with Kenner standards. The particular type of signed sample shown here is in the form of a completely-finished action figure, assembled, painted, and bagged along with its accessory. Though the figure comes from a finalized production mold, and thus has the date and copyright markings on its legs, it nevertheless is an early sample, and may feature slight differences from the figures which were eventually released to stores. The bag holding the figure is stapled to a small card with the G.M. Products, Hong Kong logo, and the words "signed sample" printed at the top. The purpose of the card, which appears to be very similar to those used on similar packaging samples, is to allow for the signatures of various engineers, as well as their comments as to what about the figure's production might be improved upon. In the case of this 2-1B sample (here called, "2-1-B"), the comments say: "need to minimize flow mark on head and leg." The figure itself is painted with a color of blue that is much more metallic than the blue of the regularly-released version. Judging by the written note on the sample card, the vendor from which it originated went by the name of Smile, and operated out of Macau.